Mulch varies in composition but is most commonly made from organic material such as leaves, wood chips, grass clippings. 5 reasons why you should apply mulch around your plants. There doesn't seem to be enough hours in the day. Your time is precious! Whether maintaining landscape is a passion or a chore, the last thing you want to do is see your hard work go to waste. If you don't use mulch to finish the job properly, you'll have to work doubly hard and possibly lose your plants altogether. Mulched not only deters erosion, it provides much-needed nutrients for the soil as it breaks down, aided by the daily business of worms and other organisms. No matter what climate youre in, your plants will need mulch the same as say Tampa Florida, or a landscape in Atlanta Georgia, both ares of the country will need mulch protection for their plants. When weed seeds are exposed to the sun, they germinate. When they are buried beneath a layer of mulch, they do not germinate. It's almost too good to be true. If you have spent long hours weeding your flowerbed, you really must do yourself the favor of properly mulching before you call the job finished. 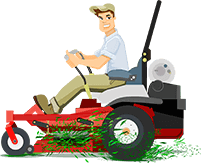 The weeds will be back before you know it, and you'll have the job to do all over again.